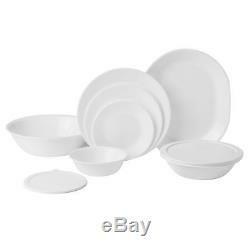 74-Pc Dinnerware Service for 12. The original break and chip resistant glass dinnerware. Trust that it can stand up to the rigors of everyday life and still look great. Includes 12 each: 10.25" dinner plates, 8.5" luncheon plates, 6.75 dessert plates, 18 oz soup cereal bowls and 10 oz dessert bowls. 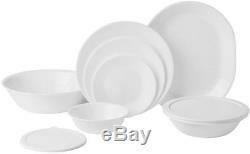 Includes 6 each: 18 oz soup/cereal bowl plastic covers. Includes 2 each: 1 qt serving bowls, 2 qt serving bowls, serving platters and 1 qt serving bowl plastic cover. BPA-free plastic lids are refrigerator, freezer, microwave and top-rack dishwasher safe. Check out my other items. We can make you happy if you give us a fair chance. We cannot make it right unless we know about it. Leaving negative or neutral feedback does neither of us any good. The item "Corelle Livingware Winter Frost 74-Pc Dinnerware Service for 12 withServe set NEW" is in sale since Thursday, August 16, 2018. This item is in the category "Home & Garden\Kitchen, Dining & Bar\Dinnerware & Serving Dishes\Dinner Service Sets".seller" and is located in Vienna, Virginia. This item can be shipped to United States, Canada, United Kingdom, Denmark, Romania, Slovakia, Bulgaria, Czech republic, Finland, Hungary, Latvia, Lithuania, Malta, Estonia, Australia, Greece, Portugal, Cyprus, Slovenia, Japan, China, Sweden, South Korea, Indonesia, Taiwan, South africa, Thailand, Belgium, France, Hong Kong, Ireland, Netherlands, Poland, Spain, Italy, Germany, Austria, Israel, Mexico, New Zealand, Philippines, Singapore, Switzerland, Norway, Saudi arabia, Ukraine, United arab emirates, Qatar, Kuwait, Bahrain, Croatia, Malaysia, Brazil, Chile, Colombia, Costa rica, Panama, Trinidad and tobago, Guatemala, Honduras, Jamaica, Antigua and barbuda, Aruba, Belize, Dominica, Grenada, Saint kitts and nevis, Saint lucia, Montserrat, Turks and caicos islands, Barbados, Bangladesh, Bermuda, Brunei darussalam, Bolivia, Ecuador, Egypt, French guiana, Guernsey, Gibraltar, Guadeloupe, Iceland, Jersey, Jordan, Cambodia, Cayman islands, Liechtenstein, Sri lanka, Luxembourg, Monaco, Macao, Martinique, Maldives, Nicaragua, Oman, Peru, Pakistan, Paraguay, Reunion.